A Rohingya refugee from Myanmar carried water through a refugee camp in Bangladesh last month. The refugees fled last year to escape a ferocious campaign of violence by Myanmar’s security forces. When a senior diplomat from Myanmar told a gathering of the United Nations Human Rights Council on Wednesday that his country was “committed to the defense of human rights,” he drew an outraged rebuttal from the United Nations’ top human rights official. [post_ads]The claim “almost creates its own level of preposterousness,” said the official, Zeid Ra’ad al-Hussein, the United Nations high commissioner for human rights, dispensing with the usual diplomatic courtesies. Mr. al-Hussein announced in December that he would not seek a second four-year term as the world body’s human rights chief. This was his last appearance in the council before his term expires at the end of August. The council was meeting in Geneva to debate the plight of more than 700,000 members of the Rohingya ethnic group from Myanmar stuck in overcrowded camps since fleeing to neighboring Bangladesh last year to escape a ferocious campaign of mass killings, rapes and burning of villages by Myanmar’s security forces. Mr. al-Hussein has condemned the crackdown on the Rohingya, a Muslim minority in Buddhist-majority Myanmar, as a textbook case of ethnic cleansing and possibly even genocide. On Wednesday, he delivered a scathing review of Myanmar’s attempts to whitewash those events and challenged the government’s claims that it was willing to take the refugees back. The senior diplomat, U Kyaw Moe Tun, told the council that Mr. al-Hussein’s statement was misleading, relying on unverified facts, and he invoked the government’s stock defense, that the security forces were merely responding to attacks by Rohingya militants. Mr. al-Hussein “conveniently failed to mention” a massacre of 99 Hindus he said was carried out by Rohingya “terrorists,” Mr. Kyaw Moe Tun said. Myanmar’s government, he said, strongly condemned all human rights violations. Mr. al-Hussein presented a very different narrative. More than 11,400 Rohingyas had fled Rakhine State in Myanmar this year, and all those interviewed by his staff had reported continuing violence and abuses, he told the council. In January, Myanmar reached an agreement with Bangladesh on the repatriation of Rohingya refugees. In May, it struck an agreement with the United Nations that it presented as a first step toward their repatriation. 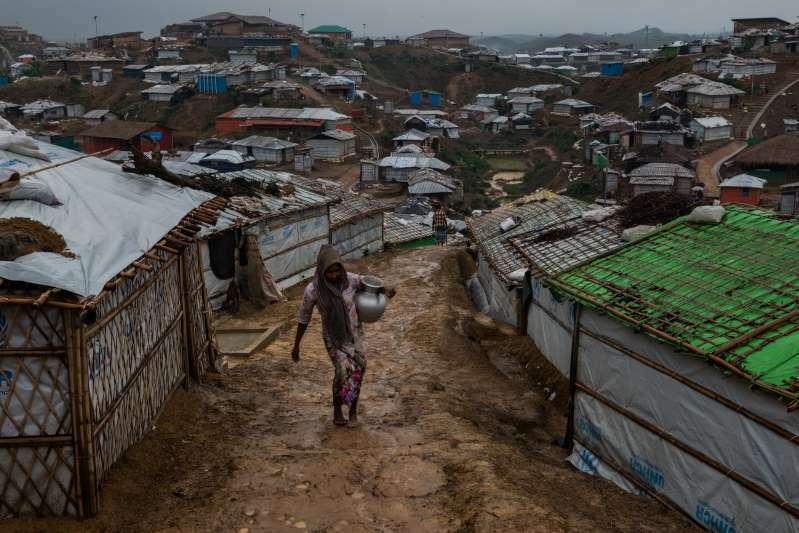 But not a single Rohingya Muslim has been able to return as part of an official repatriation program, and United Nations agencies, which are still denied free access to Rakhine State, say there is no immediate prospect of starting one. Moreover, the authorities had arrested most, if not all, of those who had made their own way back. They included 58 Rohingyas who returned between January and April and were then imprisoned. After receiving a presidential pardon, the members of the group were transferred to a “reception center” in conditions that Mr. al-Hussein likened to administrative detention. About 90 others who tried to leave Rakhine State by boat last month, but were forced back by engine failure, had also been detained. Myanmar’s sincerity on repatriation would not be demonstrated by the number of agreements it signed, Mr. al-Hussein observed, but only by granting citizenship to the Rohingya, including 120,000 villagers displaced by violent clashes in 2012 and held in camps ever since. He gave an equally stark assessment of prospects for any meaningful investigation by an independent commission of inquiry, which the government announced in May when it said it would look into allegations of violations by the security forces. The government has conducted a series of inquiries into these events but has issued blanket denials of abuses and has blamed Rohingya militants for instigating any violence. The only exception, Mr. al-Hussein said, was a village massacre reported by Reuters that resulted in 10-year prison sentences for seven soldiers. Two Reuters journalists, Wa Lone and Kyaw Soe Oo, who investigated those events remain in jail on charges of violating Myanmar’s official secrets act. Instead, he urged the council to create an independent international team that would use evidence gathered by a United Nations fact-finding team to investigate the criminal liability of individuals involved in the security forces’ campaign.